Tomorrow is Thanksgiving here in the States - shut-up Canada, we know you had yours first - and today's Nice Price or Crack Pipe candidate is like an unexpected relative showing up for the family meal. You're going to need to decide if this weird Jeep has arrived with a price that's anything near worth being thankful for. Fully 87% of you said you'd have to be a total Zil-do to spend nearly a million bucks for a 1989 Zil armor-plated limousine. That's right, nobody was rushin' to defend the asking on that former presidential ride, and in fact not even Putin's steely glare could change a single mind. Well, maybe it could. After all, it's kind of persuasive. I mean, he's pretty tough, right? Um, let's move on. You don't know how lucky you are, boy, back out of the USSR. Hey, what's the most anti-Russian vehicle out there? Yeah, perhaps the cigar-chompin' U.S. Army Jeep. It is after all perhaps the most iconic representation of the American military - from back when we used to win wars. Today's 1944 Jeep replica looks sort of, kind of, a little bit like that original Jeep. That is, it does if the original were stretched out and squashed down and fitted with what look like garden edging for wheel arches. You know what, I don't really know what the hell this thing is. It's still oddly intriguing, however. What I can tell you is that it's apparently powered by a Mitsubishi four - at least that looks like a Mitsu mill in the pics - and comes with an column shifted automatic to boot. Now, considering those features, and the the '80s beige seats, it's making me think this custom has arisen from the ashes of an old Mitsu pickup truck. That's just a hunch however, and the ad offers no details. It also doesn't appear to be AWD, there being no levers in the cabin, nor evidence of locking hubs up front. It does have a jaunty little stake bed back, and a surrey top, sadly without the fringe on it, so it's got that going for it. The matte black paint looks perfectly serviceable, if a little odd a choice when accompanied by that radio flyer stake bed. The ad says that the truck comes with brand-new off-road tires and that it is a joy to drive. Of course it also describes it as a Willies - meaning the feeling you get when you're mildly scared - rather than a Willys, so YMMV. Mechanically, the ad says that it's in excellent condition and runs strong. It's good that it runs strong, but I'm still not sure what it is. That makes its $8,900 price a little hard to quantify. What do you think, have you ever seen anything like this before? Wether or not you have, what do you think about that price tag? 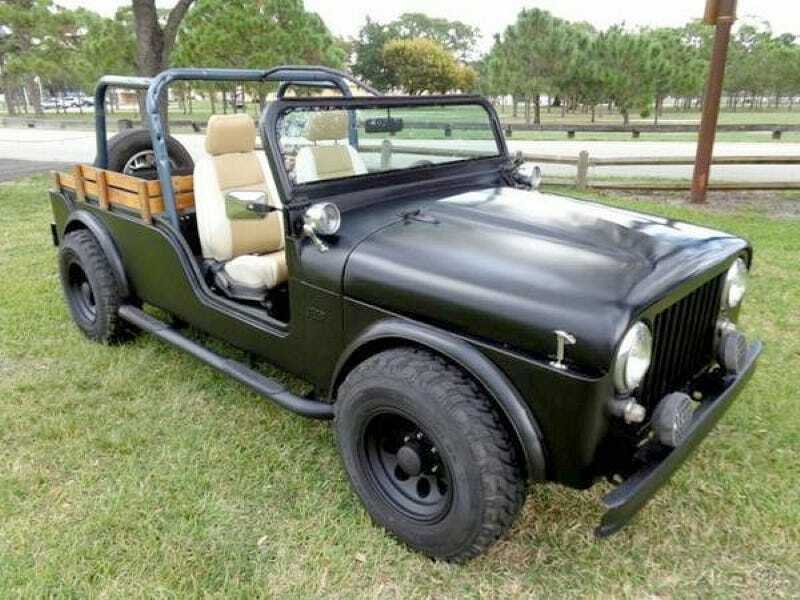 Is $8,900 a fair deal for this odd bodkin of a Jeep? Or, is this a replica that more a wreck-u-la? Miami Craigslist, or go here if the ad disappears. H/T to the awesomely-named Floyd Foont for the hookup!